​Friday afternoon saw a very excited group gather at Stonehaven to embark on a rugby tour to Edinburgh. And this group of parents and coaches had a bunch of P7 lads keen for the off with them also. ​It has become a tradition now, for the players playing there last year at primary level, to give the team a taste of all that rugby has to offer and that includes a tour. It’s a chance for the team to experience the excitement of travelling and representing there club over an extended period and a great chance for the players to socialise together. ​Our itinerary was to include not only a friendly tournament on the back pitches, not only a trip to the museum of flight, not only the chance to enjoy Seaton sands resort, not only the chance to watch Edinburgh vs Munster; but also the chance to get on the actual pitch at Murrayfield at half time in the Edinburgh match and play a short game. The kids may have been cool as cucumbers but the prospects had the parents hearts beating at a rate of knots that couldn’t of been healthy. ​So a coach journey to Seaton Sands for the Friday night on site. The boys took full advantage of all the site had to offer and it is fair to say a good evening was had. ​Saturday saw a trip for the boys to the Museum of flight (after all it couldn’t be all rugby could it?). And then on to Murrayfield for the Edinburgh match and the boys debut appearance on the countries biggest rugby stage. Nerves? Not from the boys, but the coaches and parents may have been a little overwhelmed. Needless to say the boys got onto the pitch and played the great rugby they are capable of with no hint of being overwhelmed by the magnitude of the event. Some fantastic physical rugby followed as the boys played against each other in a Red vs Black match. ​After finishing there match and watching the second half of the Edinburgh match the boys headed up to the supporters bar for the chance to meet some of the players, including the 6 nations winning captain Paul O’Connell. Tired and emotionally drained the bus took the adults back to the camp site. The kids needless to say showed no sign of tiredness at all. ​Sunday was a return to Murrayfield for a tournament with Howe of Fife, Edinburgh Accies and Heriot Watt. ​The boys headed of into Edinburgh for a team meal after there matches (parents and coaches again tagging along and being embarrassing naturally) and well deserved it was too. Sunday evening and back at the camp site for a fun Kangaroo court with the boys picking up punishments along the lines of having to drink tomato juice mixed with lime for taking to long over there hair and the like, needless to say the parents and coaches also managed to get a few punishments dealt to them. Then a last evening to enjoy Seaton sands before leaving Monday morning. 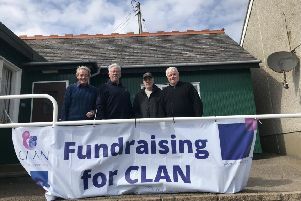 Many thanks must go to all who were involved in the fundraising activities throughout the year and also to Newtonhill businessman Graeme Reid of MAC ,Maritime Assurance & Consulting who provided the playing kit .